No one wants to be just another face in the crowd, they want to be known. So put the heart back into your messaging. Track your contacts’ information, preferences, and pipeline status with CRM. Then, use that data to nurture them through email marketing tactics. 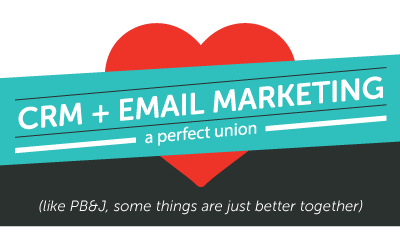 By marrying your CRM with email marketing, you can ditch the one-to-many blast and give your customers and prospects the warm fuzzies with one-to-one communication that they can actually relate to. In turn, they’ll show their love with higher engagement and increased sales.